Jody Hedlund makes me want to read historical romance. Normally, I gravitate towards contemporary first, but there are a handful of authors who I wait for their historical to come out so I can snap them up. Jody is one of them and her newest release, Hearts Made Whole, only reinforces why she's one of my top picks. Here's the blurb and we'll chat on the other side. I loved revisiting Ryan in this story, however if you haven't ready Hedlund's first in this series, you won't be lost. The Civil War has taken place between these two books, and we find a very different Ryan in this book. As the description says, he is haunted by the horrors of war and he's simply looking for peace and quiet. He finds Caroline and her siblings instead. As I've come to love with Hedlund's books, her settings are beautiful and create amazing backdrops to her stories. You can tell she's done her research. And, as a Michigander myself, I enjoy hearing about the history of my state. While her settings are colorful, her characters are even more so. Ryan and Caroline are thoroughly developed, as are their journeys--journeys that at first are facing off against one another. Caroline is fully capable of running the lighthouse on her own, but is denied the chance simply because she's a woman, while all Ryan wants to do is run the lighthouse in solitude. This leads to sweet moments filled with smile-worthy bantering. There's more than banter, however. Throughout the pages these two characters struggle with realistic problems as they're pulled closer together and eventually fall in love--though not too quickly. The pacing of this story is fast enough to keep the reader turning pages but not so fast that it's unbelievable. 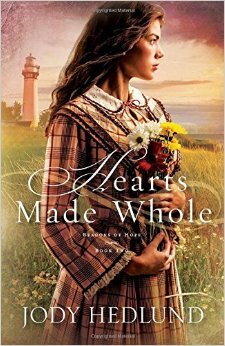 A story full of hope, I happily give Hearts Made Whole five out of five stars. You can pick it up here. Happy reading, friends!